The swingset is up and a big hit! This was cobbled together from all over–Christmas gifts from Grams (thanks! ), piles of dirt from dumptrucks (two loads!) lots of leveling by Uncle Peter (thanks! ), a juneauparents (or freecycle?) swingset from Douglas and help transporting it (thanks Sara and Peter!). Paint by Carrie, Matt, and Peter. Fun provided by Torsten. Two friends from the neighborhood are enjoying the swingset–woohoo! Thanks to Miss Ann and Miss Jeri (the great teachers!) and all the parents who pitched into the co-op! What an amazing celebration Carrie put together! Torsten’s friends got together at Our Backyard for a Volcano party. 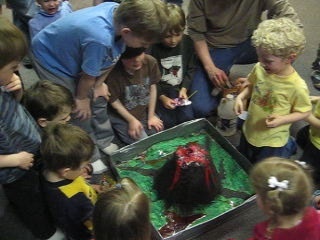 The volcano cake was amazing and great hit–fantastic! Carrie built a volcano and Matt got to make it erupt. And of course, the whole gallery is available. Of course, the whole gallery is available. Torsten’s preschool made the Juneau paper because they won the “read lots of books” contest (we don’t know if this was local, state, or national, or what..). We’re guessing they recorded reading the most books out of some group of preschools, so Scholastic gave them 1000 books to donate to someone else. The full article is at the Juneau Empire. He is moving on to the platter pull (but won’t quite go up on his own yet–he has one of the instructors go with him). And he prefers to hang on to someone, but he’s got a “good wedge” (can stop!) and will go down on his own–both fast, and in control. Amazing! The two photos below give a sense for the platter pull/bunny hill ski area, but the movies below are the best. First, here’s Torsten waiting in line to go up the platter pull (he is the blue body suit, just about center picture horizontally, in front of Eva (in pink body suit) and the instructor (red jacket)). But best of all are the movies! Here is a movie of Torsten going up the platter pull with his instructor’s help. 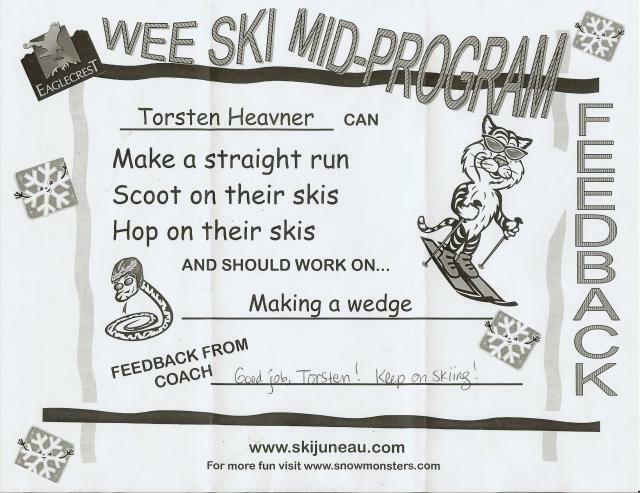 And what goes up, must come down, so here is the movie of Torsten skiing down the bunny slope.